Bloating is caused by trapped gas in the digestive system - either from swallowed air, or when the body is having trouble breaking down certain foods. Bloating typically is accompanied by cramps or constipation, and can be very uncomfortable and painful. Bloating a can be caused by certain foods or it can be a result of irritable bowel syndrome. Foods that are notorious for causing bloating include starchy foods and certain sugars, like fructose and lactose. Certain medications, like painkillers, can cause bloating, but there are a few that can help alleviate it. Antispasmodic medications are commonly used for treating irritable bowel syndrome and bloating. The medications help relieve spasms of the intestines, alleviating bloating and abdominal pain. Dicyclomine is an ingredient often used in antispasmodic medications that works by slowing contractions in the bowel. Fiber supplements, such as psyllium, can also be beneficial for bloating by stimulating digestion and relieving trapped gas. In many cases, the symptoms of abdominal bloating can be diminished by adopting a few simple lifestyle changes. Despite these limitations, make sure you still eat five portions of fruit and vegetables a day. Exercising can be extremely beneficial in alleviating bloating, constipation, and cramps. Exercising helps reduce stress and releases “feel-good” neurotransmitters, like serotonin, in the brain. The general recommendation is at least 30 minutes of low impact exercises every day at least five times a week. Exercising can also significantly increase energy levels and improve mood. Walking, cycling, and swimming are all good forms of low-impact workouts that can help treat bloating and cramps. Peppermint. Peppermint is a soothing herb that can help relieve upset stomach and support digestion. Passion flower. Passion flower is an herb that has been used to treat sleep disorders, night sweats, anxiety, and gastrointestinal disorders. Passion flower has anti-inflammatory properties, which provides a soothing effect. Ginger. Ginger can reduce nausea and other upset because it reduces histamine production in the body. Lemon. Drinking warm water with lemon and honey is helpful for easing bloating and cramps and stimulating digestion. Coconut oil. Coconut oil has recently gained popularity for its versatility and numerous health benefits. One of which is anti-inflammation, which helps relieve pain and bloating. Coconut oil can replace fattier cooking oils in your kitchen. Bloating is typically accompanied by cramps and constipation, and can be very uncomfortable and painful. Certain foods, irritable bowel syndrome, premenstrual syndrome are among the common causes of bloating. It is important to try to avoid unhealthy foods full of sugars and salt, which can cause bloating. Antispasmodic medication and fiber supplements can help relieve bloating. 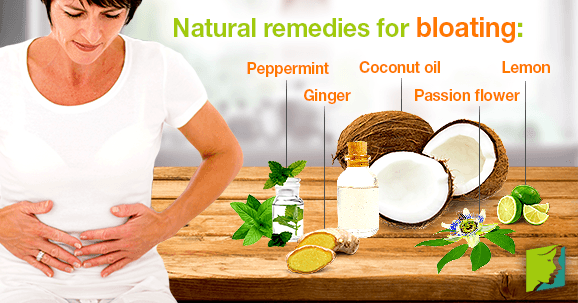 In addition, there are several natural remedies that can help ease bloating, like drinking peppermint or ginger tea. Office on Women's Health. (2012). Irritable bowel syndrome (IBS) fact sheet.